How cute are these little salt pots?! The staff were super friendly and chatty, above and beyond just taking our order and delivering our food and drinks, they actually took the time to chat to us which was really lovely. We decided to go for some cocktails first and I can’t for the life of me remember what our cocktails were called but they were pink and they contained grapefruit. 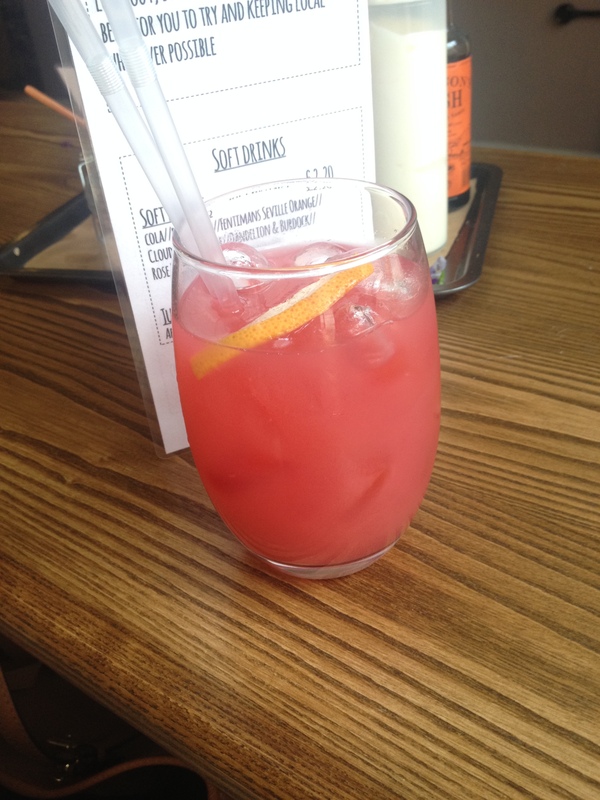 They were really tasty, fresh and easy to drink – I think I had three! I then decided upon beef burger with goats cheese and roast mushroom to top it off while Mr P added an extra patty to his burger. The burgers were also served with rosemary chips which were delicious – the rosemary adding a depth of flavour that they really benefitted from. 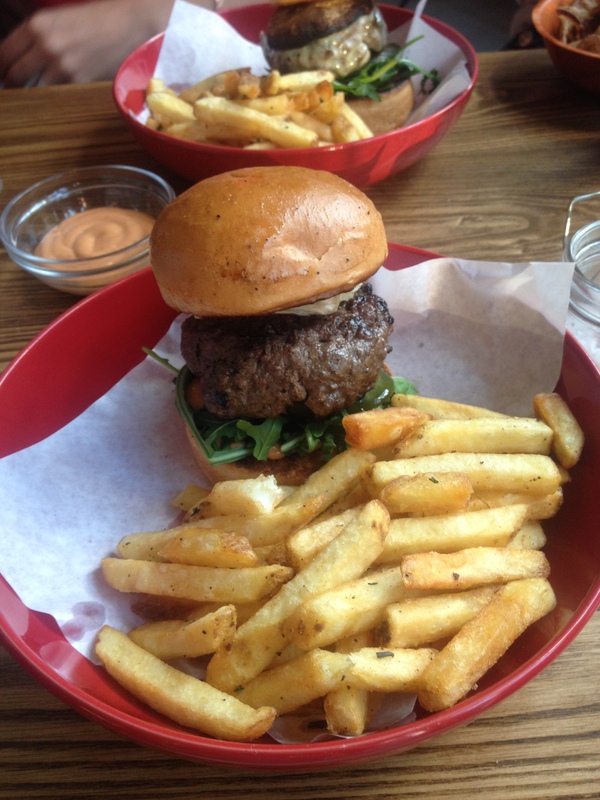 The beef burger was thick and juicy with not a sign of grizzle and cooked to perfection – tender and easy to bite into. The creamy goats cheese and roast mushroom were both full of flavour and made the perfect accompaniment. 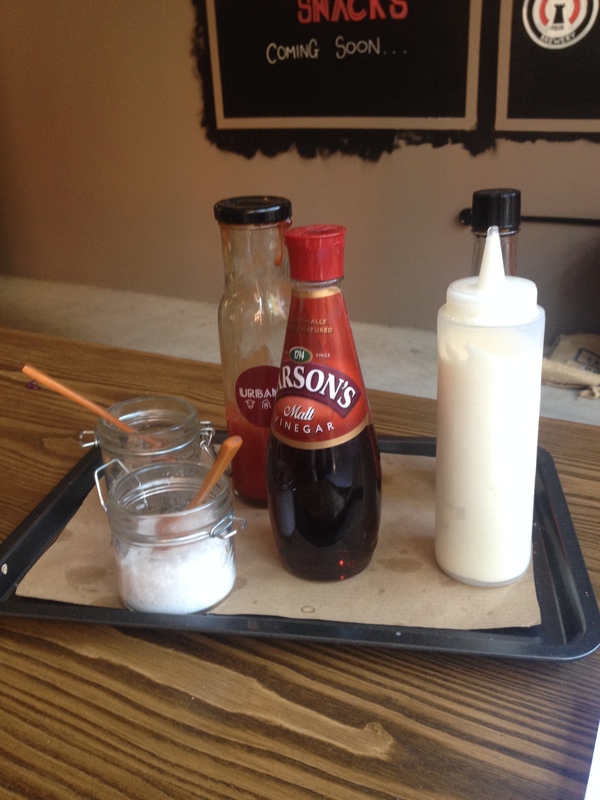 The burgers are also served with Urban 1/4’s special (and I like to think secret) recipe Urban sauce, rocket and gherkins in a soft brioche bun. The atmosphere in Urban 1/4 is quite chilled and cool – we went on a week night and it was quite busy with bright young things, so we fit in perfectly (ahem). For pudding there were only two options (remember – simplicity is the key!) – mini doughnuts and marshmallow squares, so the boys had one of each. When the desserts came out, they looked a little small but I soon realised that no one could eat a big portion of them – the sickly sweet goodness was perfect just as it was, proving good things come in small packages (but we already knew that). All of Urban 1/4’s food is sourced from local, high quality suppliers, which just adds to that really rustic, real-food sort of dining and I love knowing where my food comes from. For all this quality and service, their prices are really reasonable – a burger with toppings will set you back around £11 and cocktails are available from £4.95, one of the plus sides of dining in a student city. 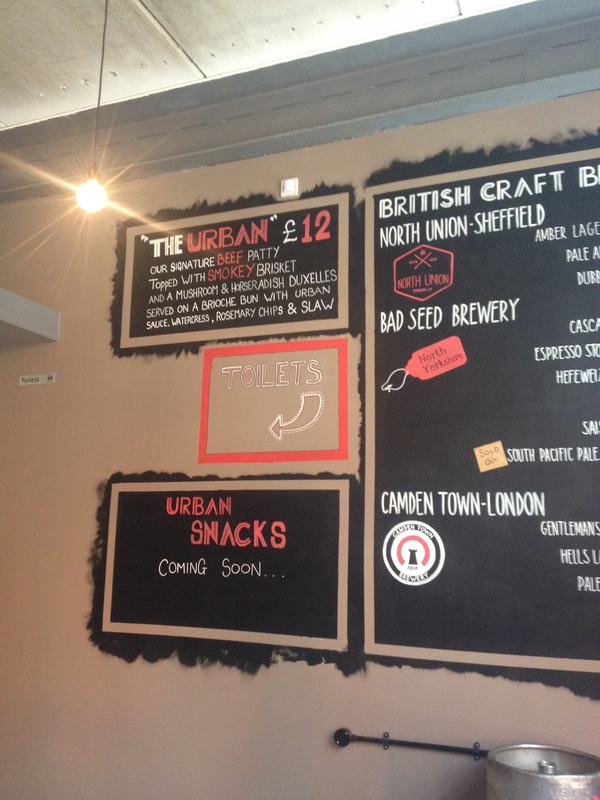 I’ve also just had a sneaky peek at Urban 1/4’s brunch menu which also looks fabulous – Shredded Toastie for me please! That burger looks delicious. Trust we all find behind, on worries. It really was super yummy! I love a good burger and love to try them at new places. Sadly I am no where near Urban 14 cause these look amazing! It was really nice! You never know, one day you might find yourself in that neck of the woods! That drink in the post looks good! I really like finding specialty burger places! You’re so right – there is nothing worse! It really puts me off! I had never had them before either – but chips with a little extra something are extra delicious! That burger looks so good! I love reading restaurant reviews! Glad you enjoyed it, I’ve started writing lots of restaurant reviews recently – just because I eat out all the time!